THE MACMASTER LEAHY KIDS MADE AN APPEARANCE ON THE 2017 SEASON OF NBC’S LITTLE BIG SHOTS. MacMaster is referring to her and Leahy’s six musically gifted children, who today are the centrepiece of the MacMaster/Leahy live set though not because the couple necessarily envision showbiz careers for Mary Frances, Michael, Clare, Julia and Alec (Sadie’s only 3). Rather, the pair realized early on that being on the road without their kids was infinitely harder than touring with them. That the children were already being home schooled (MacMaster has a teaching degree) made enacting that decision easier. “Initially we were reluctant to let the kids perform. We worried the expectations might be too much,” Leahy says. “But then one night we put Mary Frances on stage. Soon after that Michael wanted to play. And you must reward practice. When vintage comedian W.C. Fields famously quipped, “Never work with animals or children,” he clearly hadn’t seen the MacMaster/Leahy clan fiddling, step-dancing and positively delighting audiences, something a planned documentary should bring gloriously to light… whenever that gets made. “We need to make the documentary a priority,” Leahy laughs. “We’re just so busy.” When the project is completed, it will be a fitting bookend to The Leahys: Music Most of All, a short by filmmaker Peter Weyman, whose vivid depiction of the touring musical sibs won an Academy Award for Best Foreign Student Film in 1985. It’s easy to understand why Weyman – and later, MacMaster – was so enchanted with the Leahys. Their rich familial history is the stuff of lore except that it’s absolutely true. Both MacMaster and Leahy point to the 120-acres of ancestral lands in Lakefield, Ontario, as yet another key component of their children’s education and development. “Teaching can take many forms,” MacMaster says. 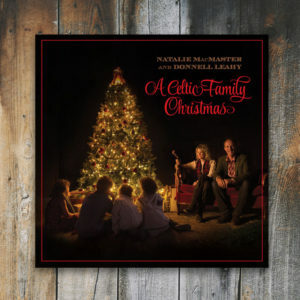 Perhaps ironically, blending their personal lives proved much easier for MacMaster and Leahy than merging their highly distinctive Celtic-rooted musical styles, which explains why the One album arrived more than a decade after their wedding even though the pair played together often. “With Donnell, I had to listen more deeply to subtleties in his music so that I wouldn’t muscle over them,” MacMaster says, noting that she met One producer Ezrin (see also Alice Cooper, KISS, Lou Reed) when guesting on singer Johnny Reid’s 2013 A Christmas Gift to You album. MacMaster pauses and reflects. “This whole thing – first playing music by myself, then playing music with Donnell, then touring with Donnell and the children and all of us playing music together – has evolved in a very natural way. True-life stories in the entertainment world (or anywhere) don’t come more remarkable than that.